This is an incredible Crock Pot meal. Not only is it hearty, rich and delicious, it's so easy to prepare. Cooking the chicken low and slow for several hours makes it tender and flavorful. The noodles take on the flavor of the chicken and the creamy soup making the whole pot irresistible. Even your pickiest eater will clean their plate. This is soon to become a new family favorite! Placing chicken breasts in the Crock Pot. Pouring soup over the chicken. Placing pats of butter on top of soup. Combining the bouillon and broth. Pouring bouillon into Crock Pot. Placing the lid on the Crock Pot. Shredding chicken with two forks. Adding chicken back to Crock Pot. Adding noodles to Crock Pot. Adding parsley to Crock Pot. 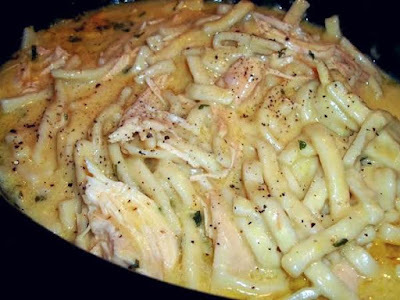 A bowl of Cassie's Comforting Chicken & Noodles. 0 Response to "Cassie's Comforting Chicken & Noodles"